Abraham Sharp was born in Horton Hall in Little Horton near Bradford in England. Although we do not know the date of his birth we do know that he was baptised on 1 June 1653 in Bradford. There is some confusion as to the date of his birth since an inscription in Bradford states that he died in his ninety-first year. However, there is good reason from Sharp's own writing to believe that this inscription is wrong and the he was indeed born shortly before he was baptised. His parents were John Sharp of Little Horton, and his wife, Mary Clarkson of Bradford. John Sharp was quite well off. 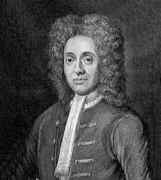 He had made money as a farmer and a merchant before serving as financial secretary to General Sir Thomas Fairfax during the English civil war. He therefore took the side of Parliament and later became a Commonwealth tax collector. Abraham was his parents sixth son and ninth child so he was brought up in a very large family. Being fairly wealthy, his parents were able to give Abraham, and all their other sons, a good education. The first formal education which Abraham received was in the village school in Little Horton, then he attended Bradford grammar school. After his schooling he started out as a merchant's apprentice in May 1669, working in the cloth business. His father died in 1672 and Sharp received a small legacy. This gave him the opportunity to give up his apprenticeship in favour of teaching writing and commercial arithmetic, which he did in Liverpool. We know nothing further of Sharp until 1684 by which time he was living in London and using the Hen and Chickens coffee house in the Strand as a mailing address. He first worked at the Royal Observatory Greenwich for some months during 1684-5 as assistant and instrument maker to John Flamsteed, the first Astronomer Royal. He remained in contact with Flamsteed from 1685 to 1688 during which time he continued to live in London. He returned to work for Flamsteed from 1688 until November 1690. During his time in London he was friendly with the mathematicians frequenting the London coffee houses. ... as useless to me as any that can but write well could be, or rather less. From November 1690 Sharp taught mathematics as the resident mathematician of William Court at the Mariner and Anchor on Little Tower Hill in London. He only did this for a few months for, in February 1691, he accepted the offer of the position of clerk at the King's shipyard at Portsmouth. During the time he worked in Portsmouth he also taught mathematics and continued to use his skills as an instrument maker. In 1693 his eldest brother died and he received a request from his widow to return to Horton Hall which he did in 1694. There he became known as a generous patron of the first Presbyterian chapel in Bradford. Sharp remained unmarried and he led a fairly unstructured life often forgetting to take his meals. As he grew older he kept more and more to himself, becoming somewhat of a recluse. Having occasion for telescope sights for a small instrument or two, request the further favour that your servant may procure for me of Mr Yarwell, or whom else you see fit, two objective glasses, one to draw about 18 inches or 20 inches, the other about 24 inches or 25 inches, and about 11 or 111/4 inch in diameter, and two convex oculars, drawing about 111/2 inches or less, and 311/4 inches diameter, such as I had formerly from Mr Yarwell. Likewise a small object glass drawing about 9 inches, and a concave ocular suited to it, but no case since I can make that myself. This being for a pocket perspective to assist my eyes, which I find now sensibly decaying, having formerly presumed too much upon them, and excessively, nay, sometimes unnecessarily, strained them. I know those whom you employ can best manage the glass grinders, who are ready enough to impose upon such as have not judgement both in price and goodness. Therefore assure myself all due care will be taken that they be good, and every one tried. I have your letter of January 26. ... You may be sure I should be glad to please both you and all men, but I must confess I have had more complaint from you than from all the rest of mankind, with the least profit, for the last you had, which I worked hard upon for the very journeyman wages, cost me thirty shillings. ... yet if your friend had not persuaded me much to give you this letter I believe I should have been silent, so much I prefer the pleasing my friends before my own interest ... I hope you will excuse this long letter, which I take no great pleasure in writing nor you in reading, but as you are my friend I would set the matter in a right light, and leave the rest to your better judgment. ... the ingenious and unwearied Mr Abraham Sharp, with his Table of Logarithms to above fifty figures ... the Construction of the Sines, Tangents and Secants; with the whole process of the quadrature of the circle to 72 figures: which quadrature was invented ... by Mr Halley. In fact Sharp used Gregory's series with x = √3 to calculate π to 72 places, a task he had carried out in 1699. He had written a paper on the subject and he had submitted it to the Royal Society but they had not published it. Sharp claimed that his paper had been read by Halley who then used his methods and claimed them as his own. In 1717 Sharp published Geometry Improved. This was an interesting book containing tables and a treatise on polyhedra. He clearly had a love for constructing polyhedra and in the book he gives precise instructions in how to form such polyhedra starting from a cube of wood. All the dimensions are given with great accuracy, far more than makes any sense from a practical point of view since he gives figures to between 15 and 20 decimal place accuracy. He gave these accurate dimensions purely out of interest (as in his calculation of π), and the whole work shows his love of these geometric objects for their aesthetic value. I have been often thinking of what you suggested, viz., instructing some person in the use of my instruments and engines, but I find these matters so little understood or felt in this country that I know not where to find anyone either of fit capacity for it or inclination that way, though my instruments could not but be of considerable value, having within the space of the last ten or twelve years laid out upon Mr Yarwell, while he followed that employment, £10 or more in glasses for telescopes and telescopic sights for different instruments. Yet should I bestow them all gratis, besides my labour in constructing, I could not engage any person I know, either for want of judgement, inclination, or convenience, to employ them to any good purpose .... Therefore must be obliged to wait till some better encouragement be offered. He was rightly counted among the most accomplished mathematicians of his day. He enjoyed constant friendship with the very famous men of the same repute, notably Flamsteed and the illustrious Newton. He drew up the description of the heavens made by the former of these (Flamsteed) in (astronomical) tables of the greatest accuracy; he also published anonymously various writings and descriptions of instruments perfected by himself... .